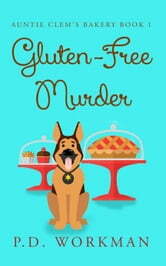 Erin Price moves to Eagle Falls, a place where everyone knows everyone as well as everyone else's business, taking over the store left to her by her aunt to start up a gluten-free bakery. The grand opening is marred by just one thing, the death of her business rival, Angela Plaint. It appears that Angela was poisoned by one of Erin’s cupcakes, making her a prime suspect. Equipped with cupcakes, her desire for the truth, and new bakery assistant Vicky's help, Erin goes head-to-head against Detective Terry Piper to solve the murder. Rumors of treasure hunting, drug dealing, and a missing boy swirl around Eagle Falls as Erin tries to sort the clues from the red herrings and find the killer before the killer can take care of her. I hope much more, but its ok, its too long for me. A fun read, and an interesting new series to explore! The book was different from a lot of cozy mysteries I've read. There was a lot of thought given to some still controversial topics. It was a good read,hard to put down,and enjoyable. An enjoyable read. Story flowed well and kept my interest to the end.